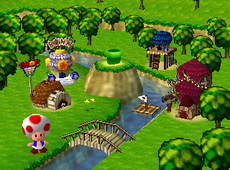 Mushroom Village is a small river bank village found in the game Mario Party. The businesses and residences are run by Toads while Toad navigates the characters around the village. This Warp Pipe is located at the center of the Mushroom Village and can be used to access Story Mode (called Adventure in this game). Once entered, Toad seems to be falling down an endless hole until the player confirms all his options. The Mushroom Bank is a storage for all the Stars the player has collected as well as the player's coins. The player can also choose any items bought from the Mushroom Shop to use in Adventure. Bowser robs this bank after the player has collected 100 Stars. The Mushroom Shop is a small business operated by the Mushroom Shop Clerk that the player can buy items from. Once all items are bought, the player will be unable to buy anything else. The many items the player can buy includes the Plus Block, the Minus Block, the Speed Block, the Slow Block, the Warp Block, the Mecha Fly Guy, the Coin Box, the Casino Box, and the Lucky Box. The Option House contains many functions. The player can choose between stereo and mono sound settings, erase their data, and listen to various music in the game. Talking Parrot can also be chosen to mimic voices of random characters. The background music is a remix of the classic B-Dasher. The Mini-Game House is a small residence where the player can play any minigames the player has bought. The player can also play a minigame for 10 coins a piece. The Pot O' Skills can also be used to access the Mini-Game Stadium. The Mini-Game Island can be reached by riding the raft on the river. A total of 50 minigames are played here to test the player's skill. This page was last edited on March 3, 2019, at 01:56.